TEXTO: (2015) Guay, A. and Thomas Pradeu (eds. ), Individuals Across the Sciences, Oxford University Press. 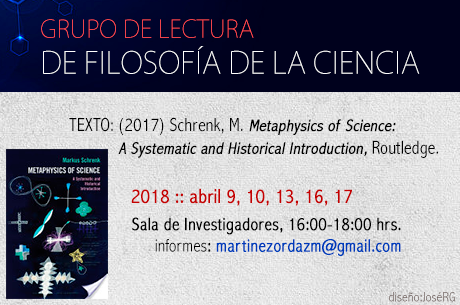 TEXTO: (2016) Schrenk, M., Metaphysics of Science: A Systematic and Historical Introduction, Routledge. 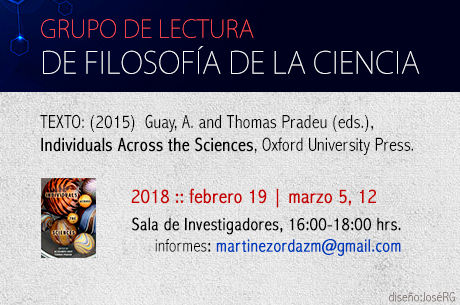 Grupo intensivo de lectura "Una introducción a la metafísica de la ciencia"
TEXTO: (2017) Chakravartty, A., Scientific Ontology: Integrating Naturalized Metaphysics and Voluntarist Epistemology, Oxford University Press.